Classic movie about software developers life. Love it. so funny, it still kills me. the jokes never get old, its so true to office life. Staplers will never mean the same once you`ve seen this movie. Not just an "office life" movie, but a crime caper too. Sort of. Still, I love this movie. A cult classic. 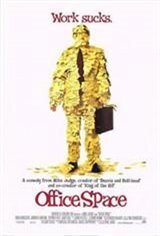 If you`ve even worked in an office, you`ll love this movie. One of the best sources of "one-liners" to use in every day conversation. They should make a sequel! I LOOVVEEEE this movie. Of course, I just saw it recently, so that makes me a few years late, and what makes it worse, is that parts of it were filmed 5 minutes away from my house, in Dallas. I have had a few friends buy it, and plenty of friends watch it. I love it so much, that I watched it like 4 times last week. I work in an office, so I can relate to much of what goes on in the movie. As a matter of fact, I have a picture of Milton in my office right now. That fool and that dern stapler...OH OH OH--OH...I don`t understand how anybody could give this movie 1 star. Apparently, they do not know good comedy when they see it. You got to see this movie!!! Very funny!